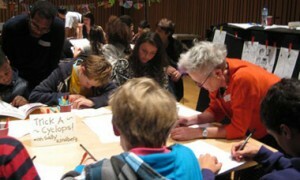 Another very busy day running comic strip workshops, this time for the Guardian at Kings Place. Lively groups of children used comic strip narratives to trick a Cyclops who had very bad dietary habits (Children on toast – yum! etc) Great stuff. This entry was posted in Festivals, Workshops and tagged comic strips, Cyclops, Greek Myths, Sally Kindberg, the Guardian, the Guardian Big Draw, workshop. Bookmark the permalink.